I decided that my reward for completing a winter half-marathon would be a tattoo. I spent months day-dreaming ideas that would symbolize my passion, dedication and experience with the only sport that I’ve ever embraced – running. that I’ve run through during the last three years. At first glance, a stranger wouldn’t guess that I’m a runner. I’m short, curvy and don’t look like an athlete, but I consistently run five days a week. Three years ago, I was a morbidly obese sedentary adult. I took-up running and transformed myself into a healthy, confident and energetic woman. My journey to become a runner wasn’t easy and I had a few failures. 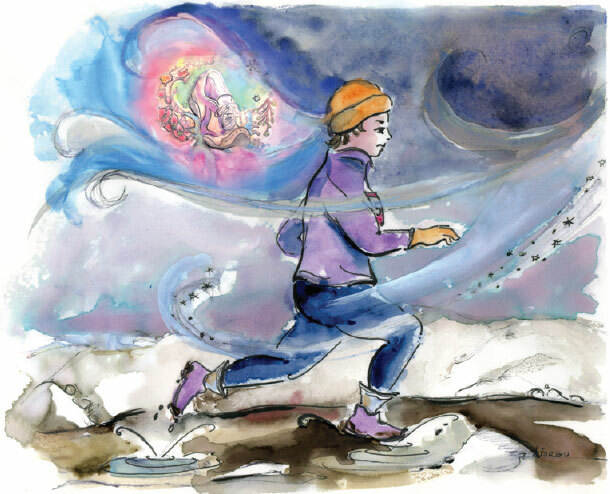 When I started running, I was a 250-pound woman who could barely run 100m without stopping. As my mileage increased, I started losing a significant amount of weight. A year later, my first race was a 10k, where I ran through the finish line in the wrong direction. It was still a victory. I weighed 165 lbs with a finish-time of 52 minutes. after my first race, guess what I was doing? Training for the Hypothermic Half-Marathon in Halifax. It’s a legendary race. The terrain is hilly and our coastal winter weather is unpredictable. On race day, I thought my half-marathon experience was the most painful thing that I’ve ever experienced, which says a lot, since I delivered twins. It wasn’t a pretty sight at the Hypothermic Half. My low-tech, last-minute attempt to keep my feet dry involved wearing Ziploc bags between two layers of socks and I’m pretty sure that I looked like death at the finish line. I was cold, wet, and my legs felt like rubber. My race time was an embarrassing 30 minutes longer than I had hoped for. I placed second-last, crossing the finish line at 2:57. In my defense, I was dodging enormous water puddles, dealing with slippery road conditions and pushing against intense headwinds (but, then again, so was everyone else). In hindsight, I’m glad the weather was horrible, it makes me feel like a running warrior and the finish line was more gratifying. most, but I have absolutely no regrets. 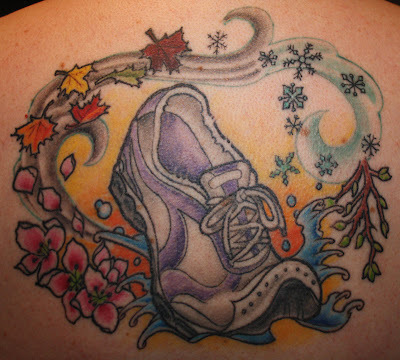 The pain of the tattoo quickly faded, much like the agony of running a winter half-marathon. To this day, my Hypothermic Half race medal is my most prized possession. It’s not valuable to anyone except for me, but it represents how far I’ve come and what I am capable of doing. And, the tattoo is a daily reminder of my strength and perseverance as a runner. of the Heart & Sole Running Club.